Book Your Holiday Party Early & Get Exclusive Extras and Savings! From intimate gatherings in our private dining rooms to extravagant banquet hall buy-outs in our iconic landmark locations, your holiday party can be made unforgettable with the award-winning Patina Restaurant Group. Our Events & Catering teams can develop customized menus and offerings that are sure to wow your guests. Book any time between now and November 30th to receive a special bonus, see below for specific offers. 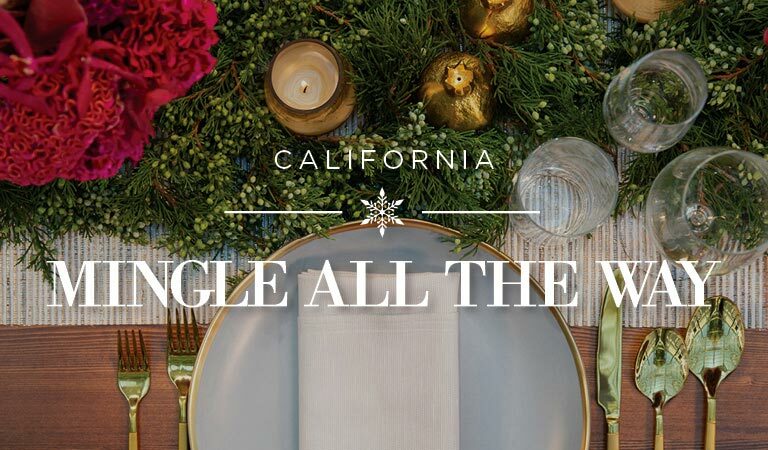 We look forward to hosting you at our holiday table! Click HERE to learn more about our award-winning catering services in Los Angeles and Orange County. Treat your guests to Pacific Rim-inspired cuisine at Tangata Restaurant. The majestic fountains, flower gardens and mission-style architecture of Bowers Museum in Santa Ana provide a quintessential Southern California setting for your holiday event. Receive a $50 gift card for every $1,000 spent in food & beverage. Excluding Saturday events. Leatherby’s Café Rouge is ideally located within Orange County’s cultural epicenter, Segerstrom Center for the Arts. Sip and indulge in traditional steakhouse fare with exceptionally artful presentations. Immerse your guests in striking décor infused with extensive natural light with windows that look out onto the Julianne and George Argyros Plaza. Book your holiday party on a Monday-Thursday and receive 30 minutes of complimentary hors d’oeuvres or an upgraded bar package. Mingle among the Urban Lights on the acclaimed campus of the Los Angeles County Museum of Art. Host your private affair in a culinary oasis of globally-inspired, California-fresh fare at Ray’s & Stark Bar, surrounded by some of the most celebrated artwork in the world. Experience our indoor to outdoor space with artist Renzo Piano’s design and architecture as your backdrop. Receive a $30 gift card for every $500 in food & beverage. With a backdrop of glimmering lights of surrounding high-rises, Café Pinot delivers a romantic dining experience. Enjoy California French-Inspired cuisine in our private Skyroom Terrace or take in the beautiful garden setting of our outdoor patio. Receive a $50 gift card for every $1,000 spent in food & beverage. Nick & Stef's boasts contemporary high-design with flexible spaces and menus tailored for a festive, memorable event. This steakhouse reimagined offers top-tier ingredients of prime steaks dry-aged onsite, fresh seafood and inventive signature sides that are sure to please any crowd. Host your holiday soirée at South Park Center, a distinctive Los Angeles landmark that rises 32 stories, with an illuminated penthouse crown. Guests will enjoy award-winning cuisine by Patina Catering and feel the liveliness of the city just blocks from L.A. LIVE and the iconic STAPLES Center downtown. Patina Restaurant is a unique venue of incomparable sophistication, conveniently located inside The Walt Disney Concert Hall. Experience the award-winning, Michelin-star rated French cuisine of Master Chef Joachim Splichal, with options ranging from the patio, private dining room and Chef’s Table. This flagship restaurant offers a gorgeous space in which to host an unforgettable holiday party. Celebrate the season in Parisian-style at Kendall’s Brasserie. Sip and indulge in Chef Jean-Pierre Bosc's modern, vibrant take on traditional French cuisine, in a chic private dining room, rich and warm, with handcrafted cabinetry and maple flooring. Reserved for those who love the art of libations in an intimate setting, The BoardRoom is a place where the spirits will rise up and toast. Host your holiday celebration and send guests traveling into a sensory experience of art, invention, and imagination. Sophisticated and stunning, the event facilities at the Music Center and Walt Disney Concert Hall are where the most magical and festive events of Los Angeles unfold. LEATHERBY’S: Cannot be redeemed for events already under contract. Not to be combined with any other offer or promotion. Applies to events with 50 guests or more. Must be booked by November 30, 2018 for holiday events through December 30, 2018. Valid for 3-Course lunch or dinner, minimum 30 guests. TANGATA: Delivered upon conclusion of event and promotional bonus card for person planning event. Cannot be redeemed for events already under contract. Not to be combined with any other offer or promotion. Must be booked by November 30, 2018 for holiday events through December 30, 2018. RAY’S | STARK BAR: Cannot be redeemed for events already under contract. Not to be combined with any other offer or promotion. Must be booked by November 30, 2018 for holiday events through December 30, 2018. LOS ANGELES CATERING: Not to be combined with any other offer or promotion. Applies to events with 50 guests or more. Must be booked by November 30, 2018 for holiday events through January 31, 2019. DOWNTOWN LOS ANGELES: Delivered upon conclusion of event and promotional bonus card for person planning event. Cannot be redeemed for events already under contract. Not to be combined with any other offer or promotion. Must be booked by November 30, 2018 for holiday events through December 30, 2018. MUSIC CENTER: Cannot be redeemed for events already under contract. Not to be combined with any other offer or promotion. Must be booked by November 30, 2018 for holiday events through December 30, 2018.